It’s a mix of amenities that draws residents and visitors alike to nine cities across Georgia. As Georgia seeks to maintain its spot at the top of the business-friendly states list, local governments are finding that a multi-pronged focus on business and lifestyle benefits is key to attracting newcomers and holding on to longtime residents and businesses. Cultural amenities and opportunities for healthy activities go hand-in-hand with business-friendly environments. There’s a continued emphasis on greenspaces, downtowns are enjoying a rebirth and even playgrounds have become all-inclusive. The results are more livable towns offering something for everyone. Walking around Avondale Estates, located eight miles east of downtown Atlanta, visitors might feel like they wandered into Stratford-upon-Avon. 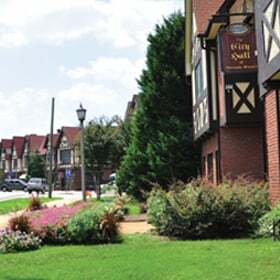 The city’s Tudor-revival style architecture was inspired by William Shakespeare’s birthplace, and when it was founded in 1924 it was one of the first examples of a planned city in the Southeast. When it comes to play, Avondale Estates hosted more than 15 festivals last year, bringing in thousands to celebrate art, music, holidays and more. The city, which is on the National Register of Historic Places, has also rehabilitated historic Lake Avondale and Willis Park, both of which include walking trails and recreation opportunities. Citizens have access to a variety of employment opportunities in the more than 80 downtown businesses and at large employers like Winpak, a Canadian manufacturer and distributer of packaging materials, and TenCate, which makes protective fabrics for firefighters and the military. Some have even found work as extras in the filming of AMC’s popular The Walking Dead zombie apocalypse television series, which began shooting in Senoia in 2010. The recognizable filming locations draw thousands of the series’ fans to the city for tours. With increased visibility comes growth, and Fisher says in the past decade an average of 130 people have moved to Senoia each year. He cites a variety of residential options, including a partnership with Habitat for Humanity to build affordable senior housing. By any definition, Carrollton is a city on the move. Located 45 miles west of Atlanta, this town of about 27,000 is a place where people from all walks of life find things to enjoy. Southwire, one of the nation’s largest cable manufacturers, and the 3,000-employee Tanner Health System are located downtown, and the University of West Georgia is nearby. Surrounding these entities and hundreds of other businesses and residences is the 18-mile Carrollton GreenBelt, Georgia’s longest paved bicycle loop and the hub for all things outdoors in the city limits. Smart planning has led to a high-quality-of-life downtown, and planning continues to address car-dependent highway corridors leading into the city. A road diet for Bankhead Highway is in the works to reduce lanes and increase their efficiency while adding bike trails and sidewalks to encourage more non-vehicular traffic. Grizzard says Carrollton’s arts community is very strong, and he’s “amazed at the number of artists who live here.” The Carrollton Center for the Arts hosts ongoing exhibits, dance performances, the Carrollton Symphony Orchestra and the Carrollton Jazz Orchestra. The town is also home to West Georgia Technical College, which Grizzard says is a great value because its classes are designed to “make sure we have people to fill the jobs. Located on I-75 about an hour north of the Florida line, Tifton is the area’s regional hub. Its population of 16,800 doubles on weekdays with people traveling to work at Tift Regional Medical Center, the Target distribution center, the American Textile manufacturing facility and other smaller businesses. With hotels lining the highway, a bustling downtown and neighborhood revitalization, Tifton is being transformed while striving to maintain its South Georgia way of life. “We’re a medium-sized city with a small-town charm,” says City Manager Pete Pyrzenski. He believes Tifton epitomizes the live-work-play ethic through ample employment opportunities, the availability of cultural amenities like the Tift Theatre for Performing Arts, a variety of recreational activities and events, and old tobacco buildings converted to trendy residential lofts downtown. In addition, Abraham Baldwin Agricultural College, University of Georgia’s Tifton campus and Southern Regional Technical College offer post-high school educational options for virtually any interest. “The education equation is working,” he says. “It’s having a dynamic effect on our community” by equipping young people with the skills they need to work in the area. Affordable housing is also being created via a public-private partnership to build a planned community of single- and multi-family homes south of downtown. Planning is something Tifton does well as evidenced by the PlanFirst designation it received in 2017 from the Georgia Department of Community Affairs. Pyrzenski believes thoughtful planning has enhanced the town’s appeal. In the Cherokee language, Toccoa means beautiful, and this Northeast Georgia town of more than 8,000 lives up to its name. Near scenic Lake Hartwell, downtown Toccoa transports visitors back to the 1940s with its restored buildings, including the Historic Ritz Theatre, which is on the National Register of Historic Places. These structures house more than 150 businesses on the ground floor with upper floors converted to apartments. The downtown’s historic character has attracted filming for six movies in the past three years, according to Connie Tabor, community development director. “There’s a real Mayberry feel to our downtown,” she says. Just about everywhere around Toccoa, visitors see the word Currahee, which means “stands alone” in Cherokee. It’s the name of a nearby mountain, the local campus of North Georgia Technical College and the world-renowned military museum. Toccoa’s military heritage is one way the town stands out, with its World War II training grounds featured on the HBO series Band of Brothers and re-enactments from that period during the annual Currahee Military Weekend. Along with historic attractions and natural beauty, including Toccoa Falls, one of the tallest waterfalls east of the Mississippi River, the city boasts an active symphony, arts programs and Lake Toccoa Recreational Park, which includes a public golf course. But it’s not all play in Toccoa. For a town its size, there are many employment opportunities, such as Stephens County Hospital, a 96-bed acute care facility, and four sizable manufacturers. Canton has its eyes on the future, not the past. The North Metro Atlanta city prides itself on its forward-thinking initiatives in public security, animal welfare and inclusive parks. All are vital for creating a healthy live-work-play dynamic. In improving public safety, Canton’s new approach is to reach out to the community, visit neighborhoods and meet residents – before crimes occur. That’s led to initiatives like Coffee with a Cop, where citizens can chat with officers at local eateries, and Read with a Cop, where police officers read to children at local schools. “It’s phenomenal how well [these programs] have worked in Canton,” says Mayor Gene Hobgood. Just last year, Canton opened its first inclusive playground at Etowah River Park. It’s designed for children of all abilities, offering such features as wheelchair access, braille signs and play equipment adapted for children with limited mobility. The Cherokee County community prides itself on its progressive animal policies. It was one of the first cities in Georgia to ban retail sales of cats and dogs. “Our purpose is to discourage puppy mills that don’t provide the best care for the animals,” Hobgood says. The city also allows pets in Etowah River Park and opened up a dog park several years ago. There’s no better example of this than the cricket box factory, a downtown building that has had many lives. It’s been a grocery store, a church and, yes, the site of a company that made cricket boxes for fishermen. “This building has a great story to tell about our town’s history,” Harris says. Now, the cricket box building is about to be reinvented as a music venue. The renovation will add another entertainment facility to Duluth’s lively downtown, where concerts, festivals, school performances and beer tastings are held. Howl on the Green, Barefoot in the Park and Duluth Fall Festival are some of the recent events. Duluth is a fast-growing city with a 2019 population estimate of more than 30,000. It’s long been viewed as a bedroom community, but that’s changing. Local leaders want residents to work here, not just sleep here. That’s why enticing corporations to Duluth has become a major goal. “We must have a great quality of life to attract corporations,” Harris says. As part of that goal, the city is improving Rogers Bridge Park, with the renovation of an old covered bridge and more walking trails. Four-legged companions are also welcome in the city, at the appropriately named Chattapoochee Dog Park. Lawrenceville has seen relatively little residential construction over the past decade, but the city is diving into the ‘live’ portion of live, work, play in a big way these days. City leaders expect to add roughly 2,000 more residents just in the downtown area in the next few years, part of what Lawrenceville City Manager Chuck Warbington calls a transformation. “We’re seeing a trend where more people want to come home from work, park their car, walk to a restaurant and go to a show downtown, and then walk back all in an evening,” says Warbington. The additional residents will come from a combination of new multifamily units, plus single family and townhomes. To accommodate them, the city is working to become more walkable as well, thanks to projects like the $200-million, 32-acre SouthLawn mixed-use development. Lawrenceville’s got the ‘play’ aspect down as well, as the home of the Aurora Theatre, which opened in 2007 and boasts some 5,000 season ticket holders. The theater is undergoing a $26-million expansion that will include a 525-seat main stage. As the seat of Gwinnett County, some 5,000 government employees work in Lawrenceville. Two miles from downtown is Georgia Gwinnett College, which enrolls nearly 12,000 students. Work is underway on a 2.2-mile linear park to link the college with downtown. Valdosta has many claims to fame, including Valdosta State University (VSU), championship high school football squads and the annual Azalea Festival held each March. Today, it continues to build on those traditions while adding new ways for locals and visitors to live, work and play. Located along Interstate 75 just north of the Georgia-Florida state line, the city is restoring its downtown, using historic preservation tax incentives to encourage new development and create employment opportunities. Several businesses have opened or renovated downtown spaces within the past 12 months, including Coleman Talley Attorneys and American Advisors Group. Valdosta’s downtown revival began 25 years ago, when it initiated a streetscape project to bring life back to the city center. Today, downtown boasts a mixture of retail, residential and restaurants, including Covington’s Dining and Catering, 306 North Restaurant and King’s Grill. A major effort underway aims to better connect downtown Valdosta to VSU, located roughly two miles to the north. This includes new sidewalks to better accommodate pedestrians and bicyclists. This article appears in the February 2019 issue of Georgia Trend.